The Seattle chapter of the Congress of Racial Equality (CORE) emerged as one of the most significant grass roots organizations in the fight for civil rights in the Pacific Northwest. Established in 1961, the Seattle chapter embodied the non-violent principles of the national organization which had been founded in Chicago in 1942. Multi-racial in composition, the Seattle chapter established a reputation for being one of CORE’s most active by the early 1960s. 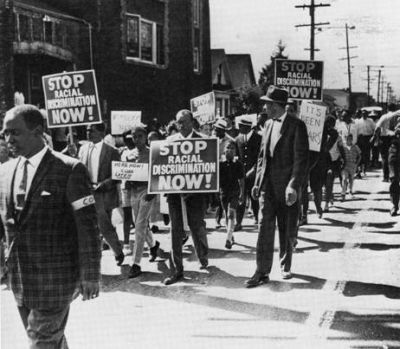 Best known for its organized protests against Seattle employers who engaged in racial discrimination, the Seattle chapter also worked to end discrimination towards African Americans in housing and education in the Greater Seattle area. Several people, both black and white contributed significantly to the founding of Seattle’s chapter of CORE. Among the most important were Ken Rose, Ed and Joan Singler, and Ray Cooper whose participation in the Freedom Rides of 1961 helped inspire many others to join the organization. Ray Williams served as the first chair of CORE and Don Matson provided significant leadership. Harold “Tim” Martin played a key role along with Reginald Alleyne, Jr.
Beginning in October, 1961, the Seattle chapter began “selective buying” campaigns against various supermarkets in the city including Safeway and the A & P. Black patrons were encouraged not to shop where they could not be employed. One of the most effective tactics was the “shop-in” where protesters would take all the shopping carts, fill them, have the cashier ring them up, and then refuse to pay. By 1962, CORE shifted its focus to the downtown department stores. Jean Durning and Reverend Mance Jackson led efforts to integrate the Bon Marche. Soon to follow were efforts against Nordstroms, and J.C. Penney. Picketing was often used as a tactic. By the end of 1963, it was estimated that African Americans had been hired into more than 250 white-collar positions. Based on these gains the Seattle chapter was considered one of the most successful in the country. The chapter made a major effort to increase the hiring of African Americans in October, 1964 with what was called Operation DEEDS (Drive for Equal Employment in Downtown Stores). The plan called for a total boycott of Seattle’s downtown shopping area. One of the most ambitious projects in the country, the boycott achieved mixed results. Led by chairmen Walter Hundley and John Cornethan, the Seattle chapter also played a key role in the larger struggle for fair housing. These efforts included the establishment of a Fair-Housing listing service, and the picketing of real estate firms who discouraged the sale of homes to African Americans. The chapter played a key role in the effort to desegregate Seattle’s public schools. In February, 1966, CORE’s leadership called for a two-day boycott of Seattle schools. Students, both black and white, were encouraged to voluntarily attend “Freedom Schools” that were mostly held in churches throughout the city. The curriculum for those two days featured black history and culture that was missing from the regular public schools. Although controversial, the Freedom Schools were deemed to be a success with more than 3,000 students in attendance. As the sixties wore on, the debate over strategy that divided the national civil rights struggle found its way into the Seattle chapter. The “Black Power” movement and the desire to emphasize Black identity eventually led the national organization to abandon integration as a strategy. This divided the Seattle chapter and eventually led to a requirement that all of the CORE membership be black. However, by the end of 1968, the chapter was effectively disbanded, but its legacy in the civil rights movement was significant and undeniable. Joan Singler, Jean Durning, Bettylou Valentine, and Maid Adams, Seattle in Black and White : The Congress of Racial Equality and the Fight for Equal Opportunity (Seattle: University of Washington Press, 2011); Quintard Taylor, The Forging of a Black Community: Seattle’s Central District from 1870 through the Civil Rights Era (Seattle: University of Washington Press, 1994); Congress of Racial Equality, Seattle Chapter, Records, 1961-1970, University of Washington Libraries; Larry Richardson, “Civil Rights in Seattle: A Rhetorical Analysis of a Social Movement,” Ph.D. Dissertation, Washington State University, 1975; Howard Alan Droker. “The Seattle Civic Unity Committee and the Civil Rights Movement, 1944-1964,” Ph.D. Dissertation, University of Washington, 1974.